What a day! On a number of occasions I have had to cancel a walk and often on these days the weather has been bad, or threatened to be so. Because of this I have been given this unwarranted reputation of being a fair weather walker. However, after years of being called "Fairweather", by Mick, Larry and Peter, on the Grindleford I proved to them that when the precipitation arrived I was up to the challenge. All the preceding week the weather forecasts had been building up to a wet and windy Saturday, but we’d paid our money and were looking forward to our first Challenge Walk of 2002. Mick, as ever, collected me from home very early in the morning and having collected Larry we motored north to Grindleford arriving there shortly before 8 o’clock. On the way "up" the weather had looked very good. Early morning sunshine promised a good day. Had the forecasters got it wrong? We soon found out we had been too optimistic as the sun went in between Chesterfield and Baslow and when we opened the car doors at Grindleford we were treated to a less than welcoming icy blast. By 8.10 a.m. we had met up with Peter and his younger brother Nick who, being a postman, covers a good number of miles every day so the 21 miles that lay ahead were unlikely to prove a difficulty for him. Fifteen minutes later we were on our way, however we were minus number one son Greg who had not arrived but with his young legs we all expected him to catch us up. The first part of the walk took us southwards along the east bank of the Derwent to Froggatt, over the river bridge and uphill towards Eyam. With overcast skies, Mick, Larry and I all expected a swift meeting with rain and were wearing overtrousers and I, like Larry, was also wearing my waterproof coat on top of a fleece. Needless to say by the time we reached the Grindleford to Eyam road the fleece was in my rucksack to reduce overheating and walking poles were in my hand to help reduce the uphill burden on my knees. Over the road I went catching up with Peter, who had stopped to put on overtrousers. Soon we were walking past Riley’s Graves accompanied by sleet with the wind beginning to increase. As the track here is approaching 1000 ft above sea level I was able to get a signal on my mobile telephone to ascertain that Greg had left Grindleford a few minutes earlier, about 9.15. What I didn’t know was that although he had got his overtrousers with him he was not wearing them. Big Mistake! 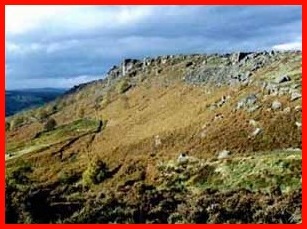 Peter and I reached the first check point, a self clip location, at Eyam Hall Car Park, at about 9.30. I was very pleased as this first leg was expected to take 1 hour 15 minute, and I’d done it with at least 10 minutes to spare. Here we met up with Larry and Mick, but Nick was keen to get the walk done and was somewhere in front. I never saw him again that day. It was a pleasant walk along the track to Housley and from there we started going south over Longstone Moor. By now Mick and I had "lost" Larry and Peter, who, although were not "racing", were going faster than I could manage. A drink of water was taken at the White Rake Check Point and we continued south before turning west to the next self clip on the moor at Grid Reference 186733. Here we hit "weather" - horizontal sleet and hail, rain and bits of snow and it was with great relief we left the moor and headed to Great Longstone. The expected time for this "leg" was 2 hours. I did it in 1¾ hours, which I thought was quite good considering the weather conditions, a leaking right boot, and a minor diversion when we followed walkers who were going the wrong way. Mick did it slightly quicker. He was now a couple of 100 yards in front, but the gap was widening. The next part of the route was from Great Longstone to Baslow and, according to the information supplied, should take about 2 hours 40 minutes. So it was best foot forward along the Monsal Trail and amazingly the sun was now out and the wind was less evil. I passed the check point and refreshment stop by the Hassop Station Book Shop before leaving the trail at Bakewell Station for the long climb up to Ball Cross Farm, and yet another self clip. It was just past Bakewell Station when I caught up with Mick. He was doing repairs to a blistered heel. However, knowing full well that he could probably give me 10 minutes start and still beat me up the hill to Ball Cross Farm I continued on. Needless to say he passed me on the hill and by the time I reached the top he was vanishing into the distance over Calton Pastures. On Calton Pastures I was able to get a signal on my mobile telephone and received a text message that stated Greg had dropped out at White Rake. I later found out he had been hit by the storm without his overtrousers on and was drenched. When we finally met up at Grindleford he was wearing the overtrousers - his normal walking ones were soaked. To have continued wearing them could have resulted in "leg hypothermia" or some similar complaint. Although the wind and rain was starting again as I progressed via Edensor and the grounds of Chatsworth it was nothing compared to the "weather" I was going to receive further on. It had taken a little over 2 hours to do the Great Longstone to Baslow "leg" and as the quoted time was 2 hours 40 minutes. I was well pleased. I had my number taken at the check point outside the public conveniences in Baslow, which were most welcome, and started up Eaton Hill on the way to Baslow Edge. Although I stopped to enjoy biscuits and a cup of tea at the refreshment stop on the way up the hill, I was only there for a few minutes, as I was keen to finish the "Gallop". However, the wind and rain and sleet had returned with a vengeance. It took 40 minutes from Baslow to Eagle Rock with the last 50 % of the ascent being horrendous. I’d been on Baslow before when the weather was bad but this was something else. All the way along Baslow and Curbar I was fighting the elements. Some runners went past with legs red raw from the wind and rain. I was well protected by waterproofs but my face was stinging from the sharpness of the sleet mixed with the sand that was being blown across the edges. My hands were freezing. My gloves had got soaked earlier on in the day. However, I really needed my walking poles to help me stay upright so I was unable to hide my hands in the warmer confines of my coat pockets. 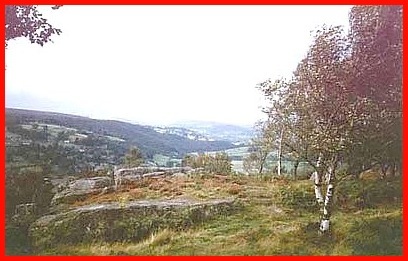 By the time I reached last part of Froggatt, with some shelter from the trees that grow near the edge of the ridge, I was able to tuck my poles under my left arm and hide my hands up my sleeve to give them the opportunity to get warm again. It was therefore with great relief that I reached the road, which is slightly below the ridge, and the end of the buffeting. Now it was a comparatively easy walk across the road and down through the woods to Grindleford. 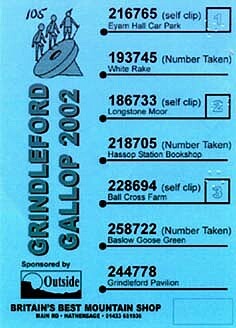 The anticipated time to get from Baslow to Grindleford was 1 hour 40 minutes. It took me 2 hours. 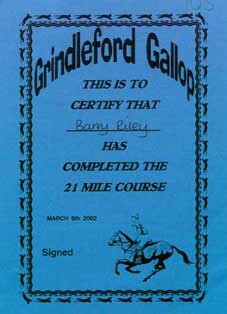 However, I still completed the "Gallop" in 7 hours, which had been my aim. What of the rest? Nick did it in 5½ hours, Larry and Peter took 6 hours, and Mick did it in 6½ hours. The strange thing is all, except Nick, had said "we are going to take it easy today Barry. We’re not going to rush. We will all walk together". I never believed them as I know I’m so slow on the hills, and increasingly on the flat, that they would have difficulty keeping to my snail pace. The refreshments at the end in the Grindleford Pavilion were great. The vegetable soup and crusty bread, tea and cakes went down a treat and I was soon warm again. Mick, Larry and I left Grindleford looking at the grey sky and clouds shrouding the top of the "edges", and guess what? Between Baslow and Chesterfield the sun came out and stayed out all the way to the pub in Warwickshire that we had decided to visit. It had been a hard but enjoyable day and I think we all deserved a drink.